Multipath Router: Everybody Gets to Stream! This project has legs. While 2 Mbps is probably OK for one multimedia stream, it’s woefully inadequate for a multiuser household, with several people streaming different entertainment. This product could conceivably provide enough bandwidth, through the purchase of multiple lines and ISP accounts, for multistreaming households. Sharing across neighborhoods is an intriguing idea too. The Multipath Router — a project seeking crowdfunding on Indiegogo — could change the way we connect to the Internet. Remember when Internet service was delivered to the home and workplace through copper voice phone lines terminating in a squeaking analog modem? Speeds using that clunky old system were restricted to a lethargic 56,000 baud, or 56 kbps — slow, in other words. Compare that to today’s generally defined acceptable broadband minimum of 2 Mbps — the equivalent of 2,000 kbps. However, just before faster ADSL and cable Internet came along to replace 56 kbps dial-up, some clever ISPs started offering dual dial-up accounts. They figured out that by bonding two modems and two phone lines worth 56 kbps Internet, you could increase speed to 128 kbps. Yahoo! It worked, and for a short time, bonded modems were the way to go for power Internet users. Those bonded connections went away with superior ADSL adoption, and analog modems were buried in landfills the world over. There’s a new market for bonding, and Justin Collery reckons that his Multipath Router is going to change the way we connect to the Internet — again. 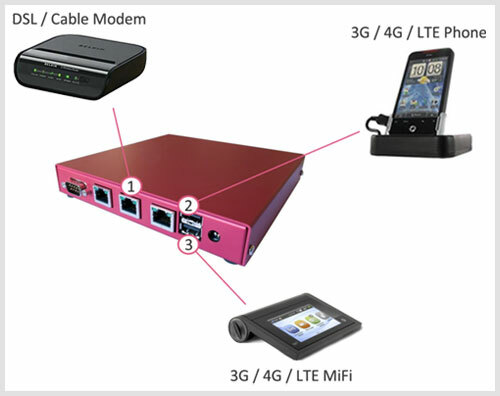 Collery’s router device combines your fixed-line broadband and wireless ISP connections. DSL, cable, 3G, 4G and WiFi inputs are combined to create one link. The idea is that the cheapest ISP source is used first, and then other, more expensive links are used as capacity requires. Added product features include wirelessly sharing bandwidth with neighbors through WiFi and phone charging. Four disparate connections send Internet traffic from the router to Multipath’s servers, which reassemble the packets. Waterford Ireland-based Multipath Networks currently has 51 funders for the Multipath Router who have contributed US$ 12,293 toward a $ 30,000 goal. The funding period has 22 days to go, ending on Oct. 31. A contribution of $ 199 gets you a fully configured Mulipath router including six months access to a set of aggregating servers that the organization is setting up. A $ 529 contribution gets you two routers. The estimated shipping date is January 2014. This project has legs. Some governments, like the UK, are using 2 Mbps as the definition of an acceptable service commitment for rural broadband rollouts. It’s been a 4 Mbps aim in the U.S. While 2 Mbps is probably OK for one multimedia stream, it’s woefully inadequate for a multiuser household, with several people streaming different entertainment. This product could conceivably provide enough bandwidth, through the purchase of multiple lines and ISP accounts, for multistreaming households. Sharing across neighborhoods is an intriguing idea too. There’s a market in the public sector for local government Emergency Operations Centers and emergency vehicles for multiple communication fallbacks. There’s also a business market where in-vehicle communications fallback is required. For example, for sales people roaming across Europe, multiple seamless fallback could be seductive. Multipath Networks’ pitch that you can combine fixed-line and 3G or 4G wireless for streaming at the consumer level doesn’t make sense, because wireless providers charge for tethering at a rate that would be prohibitive. Netflix’s streaming service, using its Best Quality setting in High Definition, uses up to 4.7 GB of data an hour. Three gigs of data can easily cost $ 60 in the U.S.
Will everyone want one in rural areas? At a U.S. minimum broadband delivery aim of 4 Mbps, maybe not. Europe’s Digital Agenda is aiming for Next Generation Networks, or NGNs, of 30 Mbps or more for all by 2020. That’s still six years away — if it happens. That’s plenty of time to sell a few of these routers.